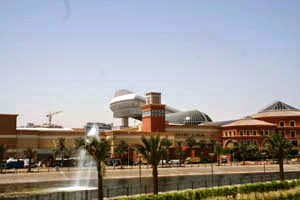 No visit to Dubai in the United Arab Emirates would be complete without a Shopping Day! So we set out to experience several different types of shopping venues. with features of modern malls. 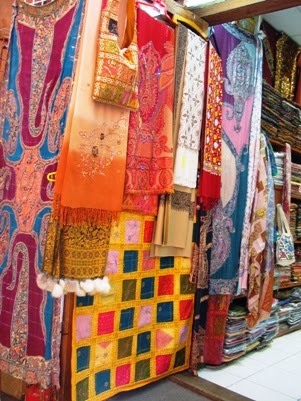 First, we took the bus to Madinat Jumeirah Souk, a vibrant Arabian market with a great selection of traditional clothing and decorative items. Although the market had a traditional ambience, today's shoppers have a wide selection of items in this pseudo-modern mall. From the grounds we had an excellent view of Burj Al Arab, the hotel that resembles a sailboat and the only 7-star hotel in the world. No wonder it was named the world's leading hotel in 2013. 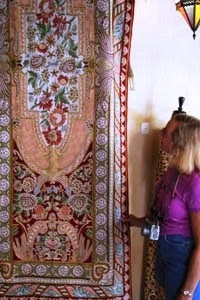 Soon after we wandered inside, I found a lovely patchwork pillow cover and a beaded runner for my dining table. Purchases one and two. 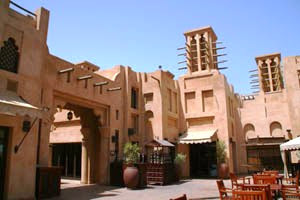 were for sale in Madinat. Next we went to the Mall of the Emirates, the largest mall outside North America and a premier shopping experience that could take all day. More than 500 stores range from economical H and M to Italian boutiques offering designer fashions. Other shops featured children’s items, sports, home furnishings, jewelry, electronics, sports equipment, and more. Overall the mall was very clean, well lit, attractive, spacious, and relatively free of noise and hubbub—and there are no taxes. Serious shoppers might want to stay in the five-star 400-room Kempinski Hotel on premises. During the hour and a half spent there I bought a notebook at Carrefour (Dubai’s Wal-Mart equivalent) and a party dress to wear to dinner that evening. Purchases three and four. Of course, what this mall is most famous for isn’t hanging on the racks. 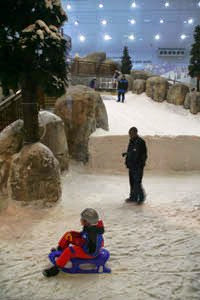 There’s an indoor ski area filled with real snow—quite a layout, although during our visit only a few snowboarders glided down the slope, while a couple of young children played in the only snow found in the desert. is the indoor ski slope. Gold, which is sold by weight according to the market price of the day, is cheaper in Dubai than in most other cities of the world (plus no taxes). Streets around the market are hives of activity with many nationalities crowding into the shops, especially after siesta time, when it’s cooler--around 4 p.m. or later. If the market atmosphere of the gold souk, where haggling hard is part of the game, isn’t for you, or you can’t find a unique piece, go to the Gold and Diamond Park. That was our choice. There we found more than 80 jewelry shops and manufacturers offering distinct collections. Take time to browse the shops for artisans whose style appeals to you, and dine in the outdoor courtyard. 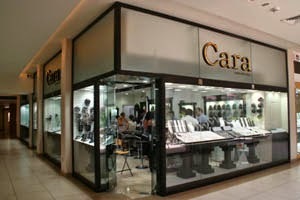 We sought out Cara Jewelry, a shop patronized by celebrities and recommended for service and quality. Sure enough, it was crowded while most other stores had few customers. As I window shopped outside, a clerk inside mirrored my steps—moving from one display case to the next as I shuffled along. I almost didn’t go in, but when I did, he was right there to help. made at stores like Cara in the Gold and Diamond Park. Most jewelry pieces are yellow gold (18, 22, or 24 carats), but white and pink gold, which are mixtures with other metals, are also available. I fell in love with glittering dangle earrings constructed of all three types of gold, and Larry found a ring in a unique design that also incorporated yellow, white, and pink gold. Purchases five and six. 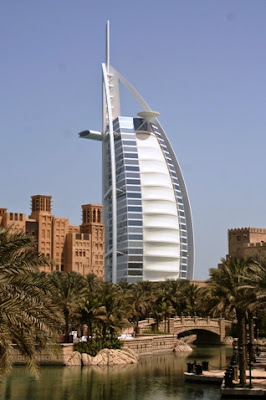 Whether you’re looking for traditional items, bargain hunting, choosing quality jewelry, or tackling a ski slope in a land of sand, Dubai is a shopper’s delight.